I found Palma to be stunning and far above my expectations. The architecture, the food, the shops, the warmth and friendliness of the people and the small winding streets with plenty to explore. 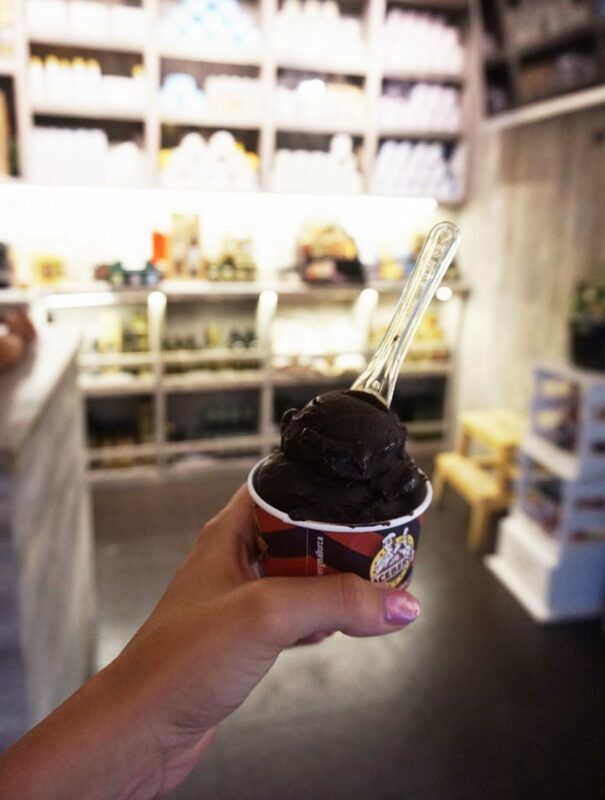 From cooling ice cream shops to vegan fine dining, here are some of the vegan restaurants, vegan friendly places that I found and some that I researched before my trip, but never got the chance to try. Overall I found that in Palma the starters are equally as big as normal sized portions and that any restaurant with a menu in more languages then Spanish and English, I tend to stay away from. Another useful thing to be aware of is that on Sundays and Mondays it’s common for restaurants to be closed in Palma. So view the websites and plan a head. I must say that the service received when going to these restaurants where always top notch, so friendly and warm. The Spanish are open, chatty and so attentive. I really think one of the highlights of Palma was the people. There are quite a few of these ice cream shops around Palma. However there is only one that I saw that they advertised vegan ice cream and that’s the location stated below. They seem to have different selections on different days. If you get the opportunity I highly recommend the lemon basil and the indulgently dark chocolate ice a cream. 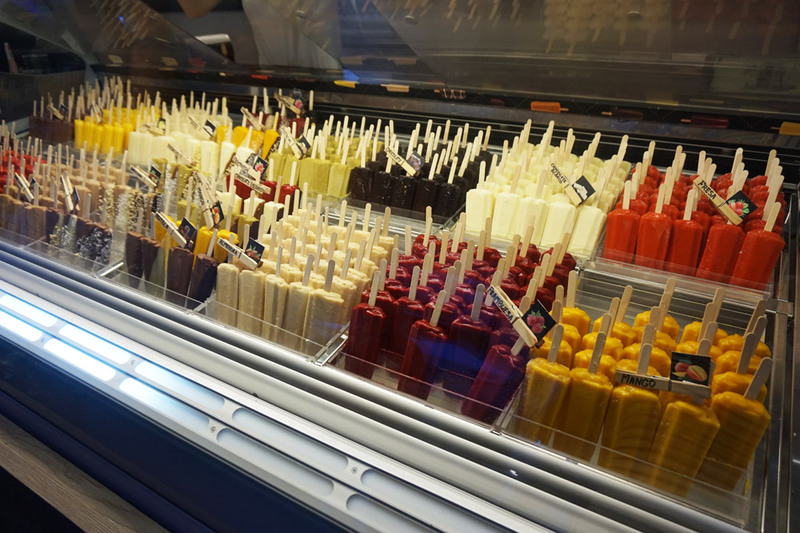 I first saw ice lollies like these in Budapest, but didn’t get the opportunity to try them then. So I was delighted when we walked past a place in Palma offering a selection including vegan choices. I had the raspberry and it was very refreshing, including a brain freeze! This is a vegan ice cream parlour at two locations in Palma. Due to the opening hours (they close at 18.00 while the other ice cream shops are open as long as they bars are!) we never made it here. I’d love to try on my next visit so this is still on my wish list! 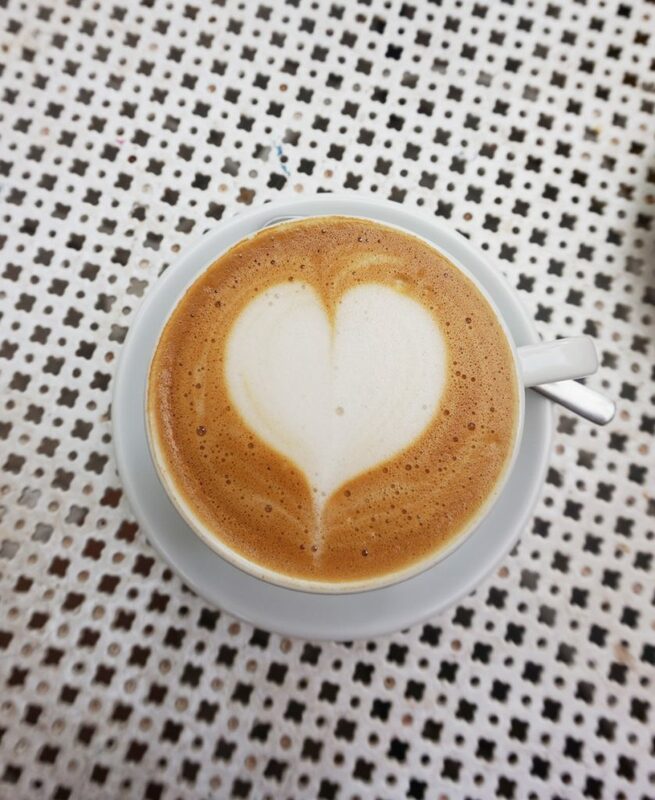 Offers coffee with a selection of plant based milks. Have vegan items on their menu. I’ve never tried their food though, only had a oat milk latte in their out door area. 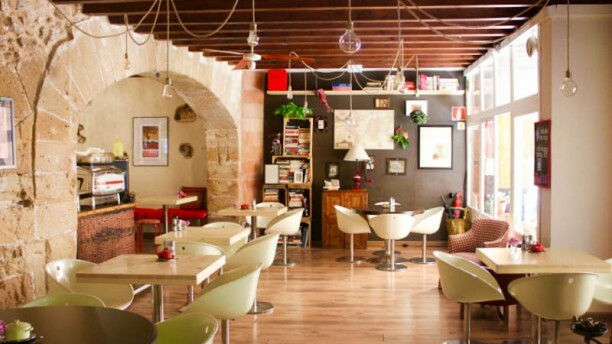 However their food looks great and this place is written about in several magazines as the coffee spot to visit in Palma. 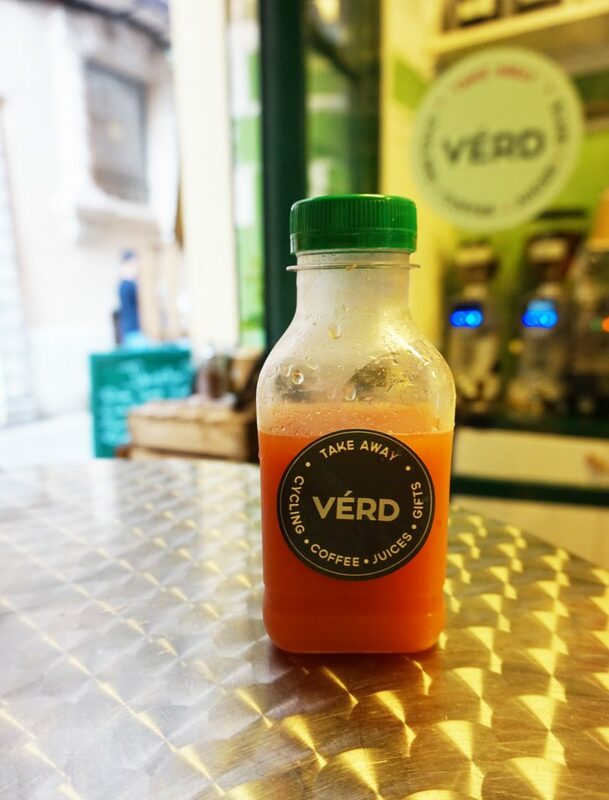 Cold pressed juices and sandwiches. Located: I’m trying to find this place online, I can’t! 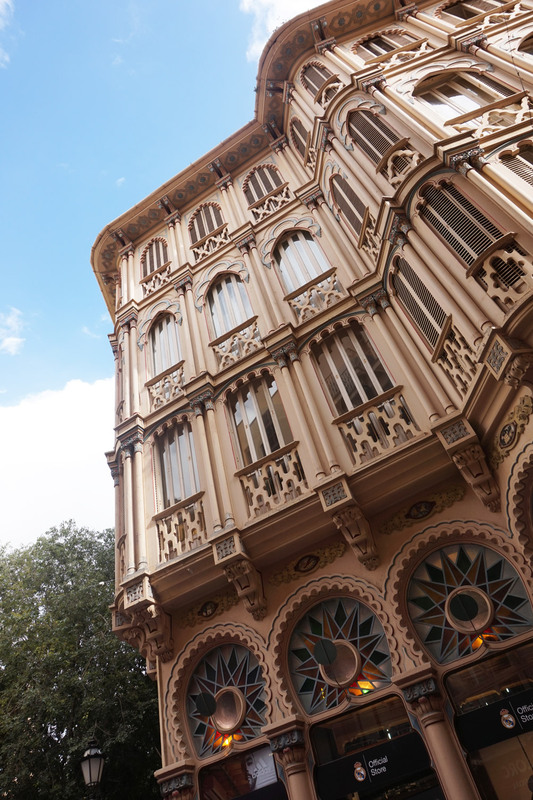 It’s on teh same street – Carrer de Sant Feliu – as Bon Lloc. However, it’s located a bit higher up from them. A must try when in Palma. The food is delicious, the setting is super quaint and the service is warm and friendly. Also, the portions are huge, their starters are the size of a regular meal, which I found to be common in Palma during our stay there. 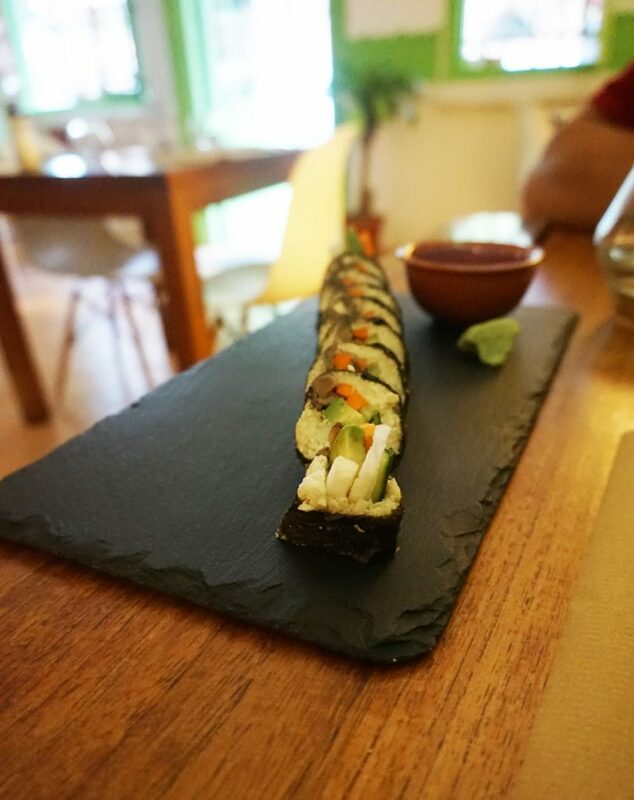 I had the “no rice” nori roll that was made with cauliflower and cashew rice instead with avocado, shiitake and some other vegetables. I really loved this dish as the “rice” was so creamy. 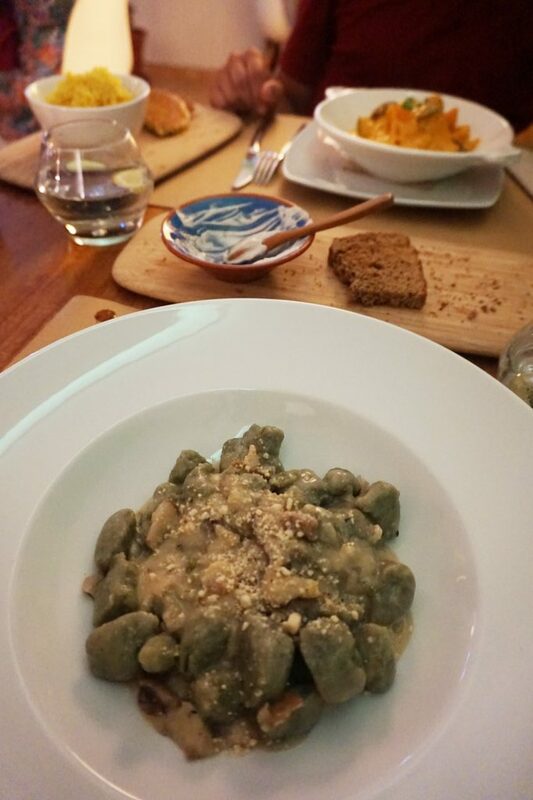 For a main I ordered the kamut and potato gnocchi in a shiitake sauce and it was divine. I like how they use kamut flour in anything from pasta to the bread which they serve. The service we received was very caring, attentive and warm. This place was so good we went here twice. 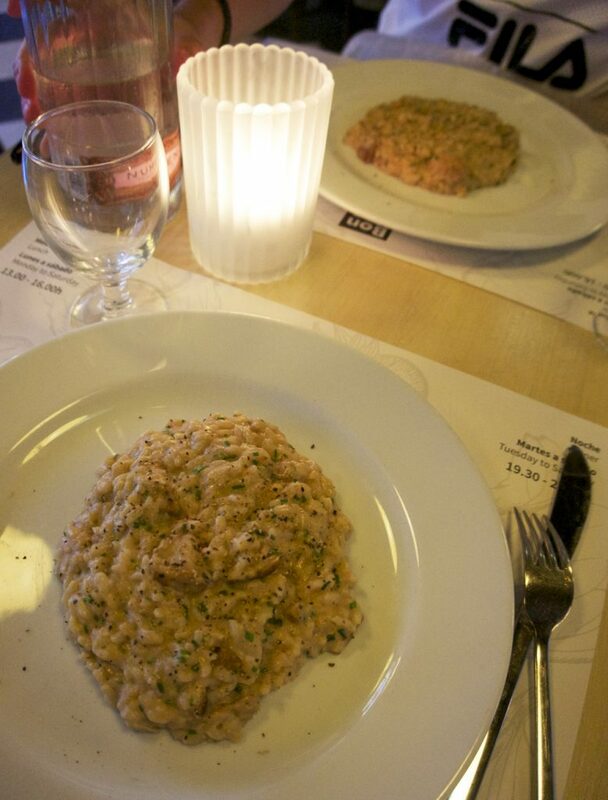 First for dinner where I enjoyed the porccini mushroom risotto. The second time we tried their lunch concept which was a four course meal. They had two dishes to choose from each time, so you got an option to choose, which I really enjoyed. Their food is hearty and home made, and for dessert on the lunch menu, I opted for the chocolate cake with a soft hazelnut frosting on top which I will dream about! The service was top notch here as well. One of the few places that are open on a Sunday in Palma. But what a gem! I was so happy to finally get a “Spanish experience” as we stayed at a hotel at the beach outside Palma inundated with tourist restaurants. We arrived at brunch time and they have a good selection of vegan items on their menu to choose from. I naturally ordered the hummus platter with grilled vegetables, pita bread and home made pickles. And to my delight they had oat milk so I could enjoy a huge latte, the first in days. The service was very professional, authentic and friendly. They really took great care of us. We found this place by chance when a restaurant that we had looked up was unexpectedly closed. This is a Japanese restaurant that serves very tasty and clean food. By clean I refer to that they make tempura without eggs, and are very respectful and understanding of vegan food and ones choice. A very attentive and friendly waiter helped me choose dishes and reassure me that they where fully vegan. I ordered a vegetable tempura as a starter – again I got a huge plate full, more then enough for two and this roll below, which is a nori tempura roll with avocado and vegetables with a sweet miso sauce. It was delicious and I really enjoyed the flavours and textures of the dish. Again, I can’t praise the service enough in the restaurants in Palma, they are attentive, friendly and warm. 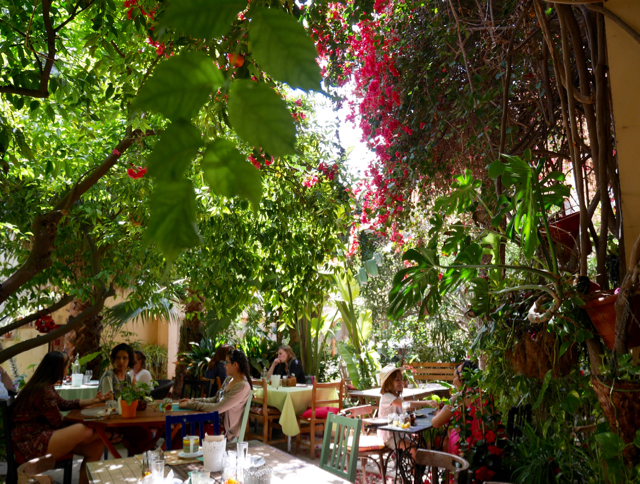 A cafe in a garden in Palma. 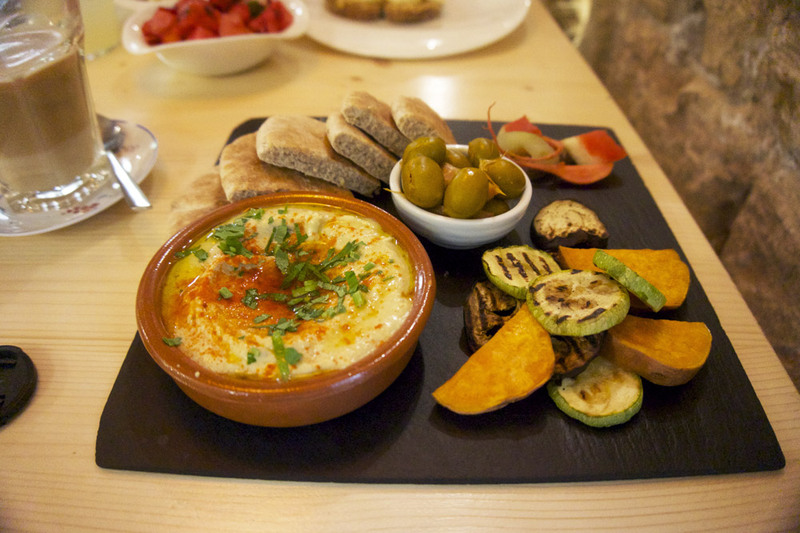 Small restaurant with vegan and vegetarian food that has got some rave reviews on TripAdvisor. Israelic/easter mediterranean food type of restaurant which naturally has vegan options on the menu. Super helpful! I’m in Palma right now and while I’m not vegan, I love places that really think about their food, which vegan/vegan-friendly places often do. We’re just back from Bon Lloc and like you, I think we’ll go twice!! Anyway, thank you for this v helpful guide.